by simply editing the terms in the word box on that page and then clicking one of the activities you'd like to use. Make sure you separate the terms with commas or line breaks. Simple as that. Posts are automatically placed in order of assignment with the newest at the top. 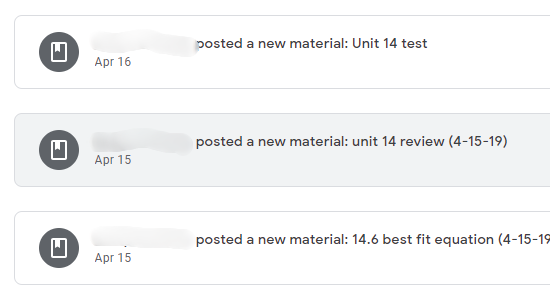 This will make it easier for students to know what assignment they may have missed or what to work on that day. Perhaps even more important is the ability to filter posts on the Classwork page by topic. To do this, click Classwork. To see all your posts for a certain topic click the topic name on the left. To return to all your topics, at the left, click All topics. Neither update is earth-shattering, but very useful nonetheless. We all love the game of Gimkit, and this weekend, we received an email about the Thanos Mode. It is only for a limited time, so I encourage educators to try it out now. One teacher, Mrs. Kenjura, stated that "when someone wins in Thanos Mode it snaps and goes through the list of players and says who survived and who is snapped." Gimkit is a great way to review, and now this add-on has upped the engagement to the game, too. I enjoyed reading this article and watching this amazing video from Edutopia. 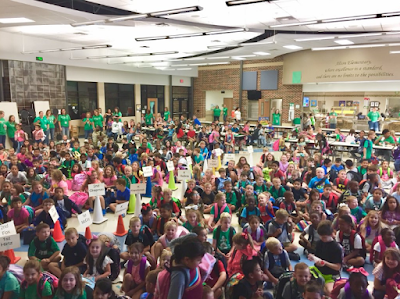 This video highlights what Fall-Hamilton Elementary School is doing in regards to providing support for students. Daily, students who need extra social and emotional support have a quick check-in with an adult at the start and end of each day. Enjoy this excellent school-wide strategy and see if and how you could implement this on your campus or in your district. In addition to having other faculty members check-in with students, you could have community members, parents, and/or district leaders come check-in with the students. This could be done both face-to-face or digitally using a web-conferencing tool such as Google Hangouts, Skype, and/or (my favorite tool) Appear.in . Consistency is key with keeping your Google Chrome account updated and safe. Last year I became much more consistent with keeping up with my Google Chrome account. I even created Google Calendar reminders that pop-up monthly to remind me of the purposeful upkeep I'm suppose to be conducting. I only choose the top 4 boxes out of the 9. Browsing History, Download History, Cookies and Other Site Data, and Cached Images and Files. Then I click on "Clear Data". All my passwords and other sign-in data will be saved and not deleted. This method of only choosing the top 4 boxes and not the bottom 5 has ALWAYS worked for me. Clearing out your Cookies and Cached Images/Files is very important if certain websites stop working the way they are suppose to. Finally, I so a quick "clean up" of my computer by going to system settings in my Chrome Browser: Chrome://settings/system . Under Reset and clean up, choose: Clean up computer. This will help find harmful software on your computer and remove it. Now that you have done the above tasks, you are ready to complete the final step in securing your account! At this link, you can now go through a check list to double check your account. 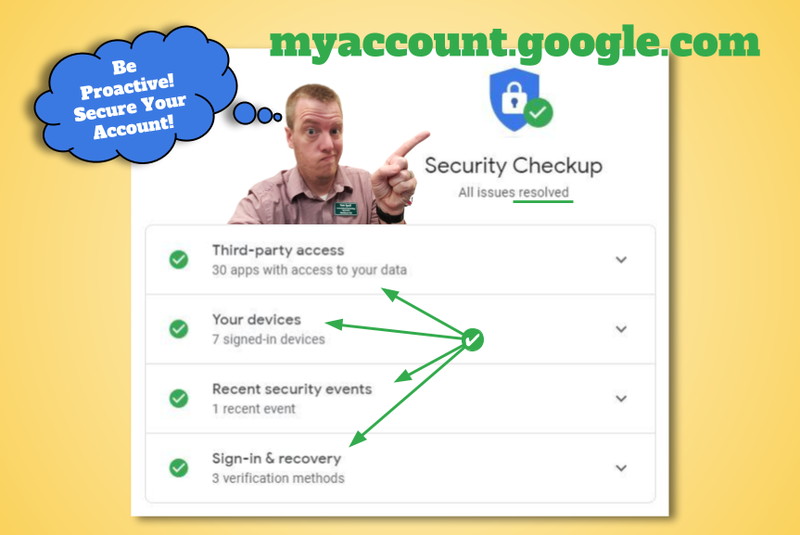 You can edit your Chrome photo, transfer your content, review your privacy settings, keep your account protected, and make Google yours by personalizing your Google experience. Also, you can check your account storage that is shared across Google services, like Gmail, Drive, and Photos. "We keep your account protected" > Get Started. From this point you can check the devices you are currently signed into. Review your recent security events. Sign-in and recovery methods that you can verify. Finally, you can check all the apps with access to your data via Third-party access controls. WOW Wednesday: Morning Meetings, Huddles, Coffee Breaks and More! Teaching Tip Tuesday: Morning Meetings, Huddles, Coffee Breaks and More! Call it what you want: morning meetings, huddles, or coffee breaks, no matter the name, these morning meetings are beneficial for both the teacher and the students. These meetings are especially imperative after extended breaks/holidays. Last year, while observing classrooms, I was able to join this morning meeting in Mrs. Kubos' 4th-grade classroom. 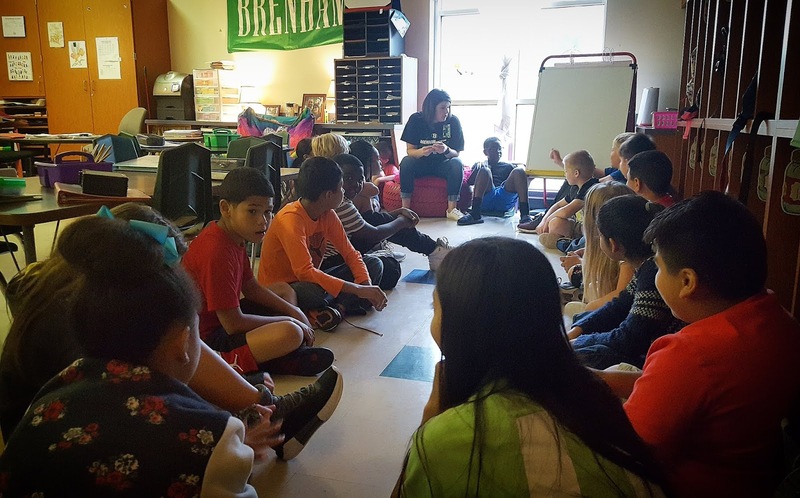 Mrs. Kubos usually held these morning meetings on Monday, Wednesday, and Friday mornings as a beginning of the week, middle checkpoint, and end of the week wrap up. "It's a great way to talk with them and build relationships"
There are many versions of morning meetings. Some are had throughout morning centers with small groups, some are held as a campus in a central location, and some are in the classroom like Mrs. Kubos' class. Become acquainted with their Chromebooks and G-Suite while working on their "Interest Projects"
Took away the stress of "home life/baggage from outside the room" prior to the 8:00 am bell. 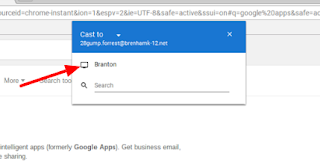 Allowed my students to work with less used G-Suite Elementary Ed tools, such as Gmail, Calendar, Chrome, Extensions, Apps, and more. Gave me the ability to see struggling students and/or shy students excel in other avenues of education. Allowed me the opportunity to talk to the students, find out how they were doing, and get them situated for the day. I first experienced a "whole campus" morning huddle while working up in Oklahoma City Public Schools. Most of the schools had gone through a program called, "Great Expectations". One of their core beliefs was to have schools hold morning huddles (Rise and Shine) as an entire campus at the beginning of each school day. This idea transferred down to Alton Elementary School here in Brenham ISD. Mr. Ogg, the Principal of Alton, has been implementing morning huddles for a couple of years now. The students LOVE it. They go over announcements, say the pledges, congratulate various student accomplishments, celebrate birthdays, and much more! Bit.ly - which lets you customize the name of your shortened link. Bit.ly even has a page to help you transition over from goo.gl here. So, to add on to Troy's recent post, I would like to introduce you to two other options for a URL shortener that I feel could benefit you in the classroom. They are Yellkey and Thinfi. Monday Motivation: End-of-year projects, ideas, and tips! "I can't wait to finally be done with testing so we can start having fun!" Why!? Why do you have to wait until May to start having a fun environment in your classroom? Projects, PBL, hands-on activities, outdoor learning environments, unconventional teaching strategies, increased use of technology, etc... can all be utilized throughout the ENTIRE school year! If you haven't started yet, how about starting now? Instead of busting out a countdown clock, or crossing out dates on a calendar until the last day of school, how about trying some of the great teaching ideas listed below! How about letting students explore their Google Drive. Let them learn how to upload, create folders, and organize their Drive. Let them explore with Docs, Sheets, Forms, Slides, Drawings and more! Give mini-tutorials or even let you students create tutorials to teach peers in the class. Have your upper-grade students go down to the lower grades with their Chromebooks and teach the younger students how to use them before next year. Have students create end of the year Posters in Google Draw. Or let them create a newsletter in Lucidpress exploring their recent school year or what their plans are for this summer! Have them create a Google Slide Presentation over a content TEK they had trouble with this year but now have mastered. Talk about what confused them about the objective, misconceptions they had, and how they finally mastered it. 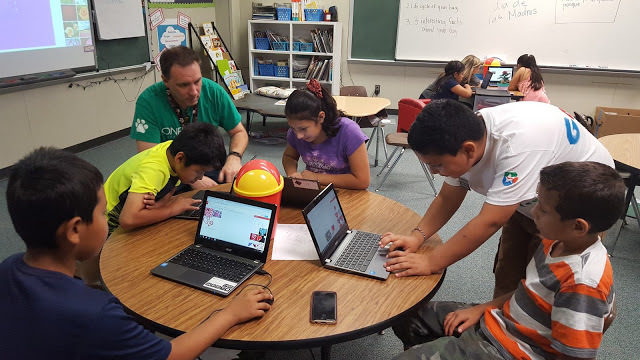 Create and plan a summer connection series with your students through Google Classroom. Fun summer assignments, book study, or even summer journal assignments to increase writing/typing skills. 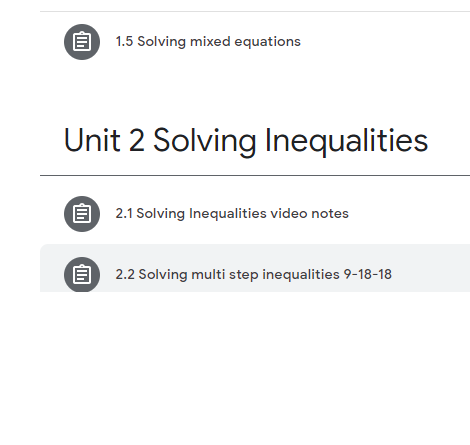 Send home summer tutorials about next grade level objectives, standards, or TEKS that they will see at the beginning of the next school year. Share with them bios about their awesome new teachers coming up in the new school year. 8 Sweet Ways to Wrap It Up! Our Favorite End-of-the-Year Activities for Grades K-2! Enjoy the rest of this AWESOME school year! Do you remember when we talked about Google Cast for Education? If not, see the article below on how to cast without being on the same network. Google Cast for Education will take what is on your student's screen and cast it to the teacher's screen. The teacher can allow only certain students to cast to her laptop, too. Recently, I had a teacher, Mrs. Coston, try to use Google Cast for Education. However, it would not let her students cast. After lots of help for my wonderful tech team, it was concluded that students had to have the enable cloud service turned on in their extension. 1.) Click the three dot and click Cast. 2.) Wait for the options to get populated. 3.) Right click on the cast icon in the top right of the browser. 4.) Click enable cloud services. *Hope this tip helps you start Google Casting again! A while back we talked to you about Google Cast, but have you noticed something extra added to your three dots, in the top right hand of the screen, on your chrome browser? Google has added the "cast" option now under the three dots. 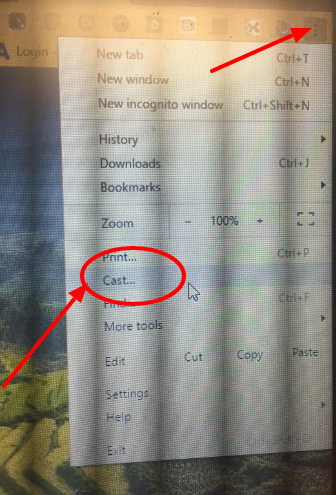 Now, the teacher just has to open the Google Cast app on their laptop, and then the students can start casting to the teacher's screen (students click the three dots and click cast). No need for students to have the extension. 2. 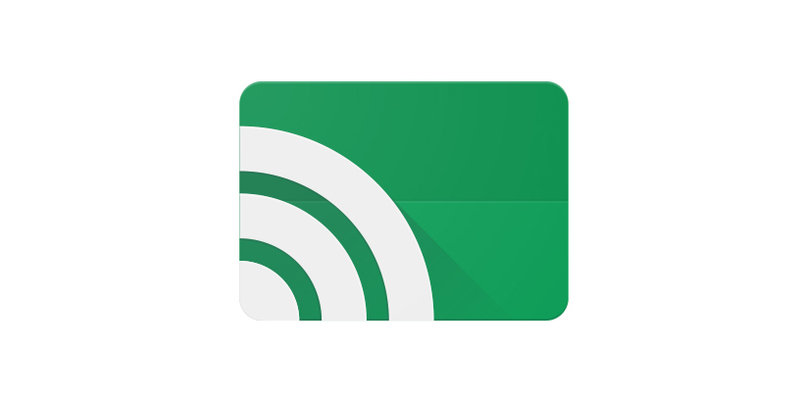 Click on Google Cast for Education (or get it, if you don't have it- Google Cast for Education App). 3. This screen will appear and students can now cast to the teacher's screen. 1. Click on the three dots in the top right side of the screen and click on the cast option. 2. Click on the teacher that you want to cast to. 1. Click Accept or Deny for students to cast to your computer. You may stop it at any time. 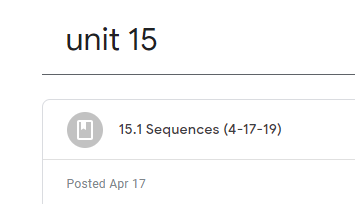 *Reminder- the student's Chromebook needs to be updated to at least the 52 version. Why Google Cast in Your Classroom? *Vote on student created projects. *Let students see other student examples.